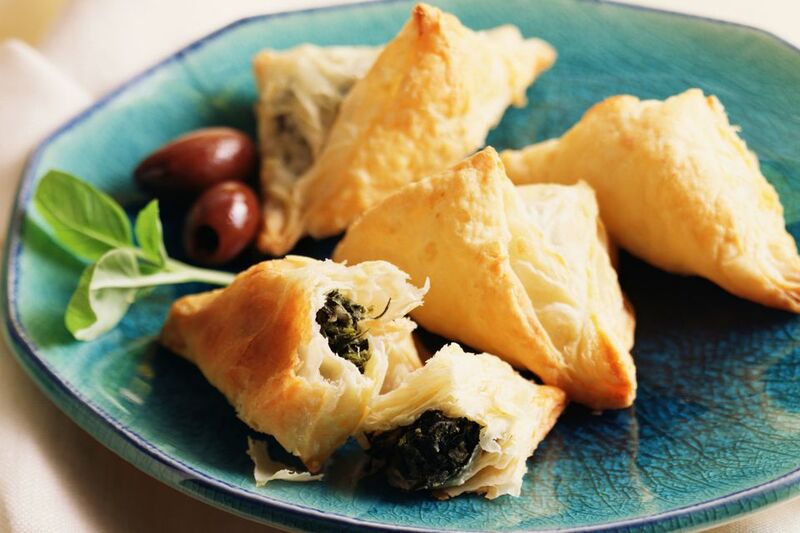 Spanakopita bites are mini phyllo pastry shells filled with a delicious spinach and feta cheese mixture. Spanakopita is a traditional Greek dish consisting of spinach and feta cheese baked between layers of phyllo dough. It can be made as a pie or "pita," as individual phyllo triangles, or somewhat untraditionally, in phyllo pastry shells. Working with phyllo can be a bit laborious, as you need to brush each sheet of phyllo dough with melted butter before layering—and there are lots of layers. Alternatively, you can use each sheet to create triangular packets, which not only requires the melted butter but also involves a specific folding technique. This recipe for spanakopita bites, however, is quicker and simpler than these other versions, since they use phyllo pastry shells (which are available frozen in the freezer section of the grocery store). They taste just as great, and they're cute to look at and fun to eat! Wash and drain the chopped spinach very well. If using frozen spinach, thaw completely and squeeze out excess water very well. Spinach should be quite dry. Heat the olive oil in a deep sauté pan or dutch oven. Sauté the onions and green onions until tender. Add the spinach, parsley, and dill and cook for 5 to 10 minutes until the spinach is wilted and heated through. Add the nutmeg and season with salt and pepper. Cook the spinach mixture until the excess moisture evaporates. You want it to be on the dry side. Remove from heat and set the spinach aside to cool. Once the spinach has cooled, add the crumbled feta, eggs, and ricotta cheese, and mix until combined. Preheat the oven to 350 F. Lightly brush the insides of the frozen phyllo shells with olive oil and fill with spinach mixture until approximately 3/4 full. Bake the filled shells on a baking sheet for 15 to 20 minutes, or until the filling is cooked through. Serve immediately.